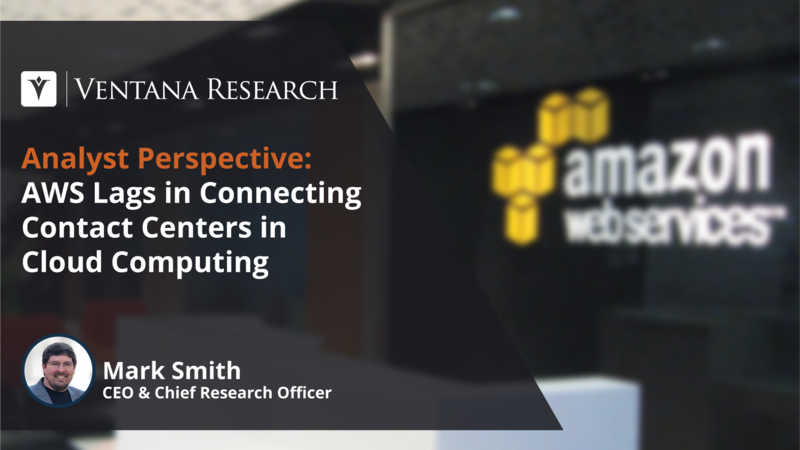 I am happy to share some insight on AWS drawn from our latest research. 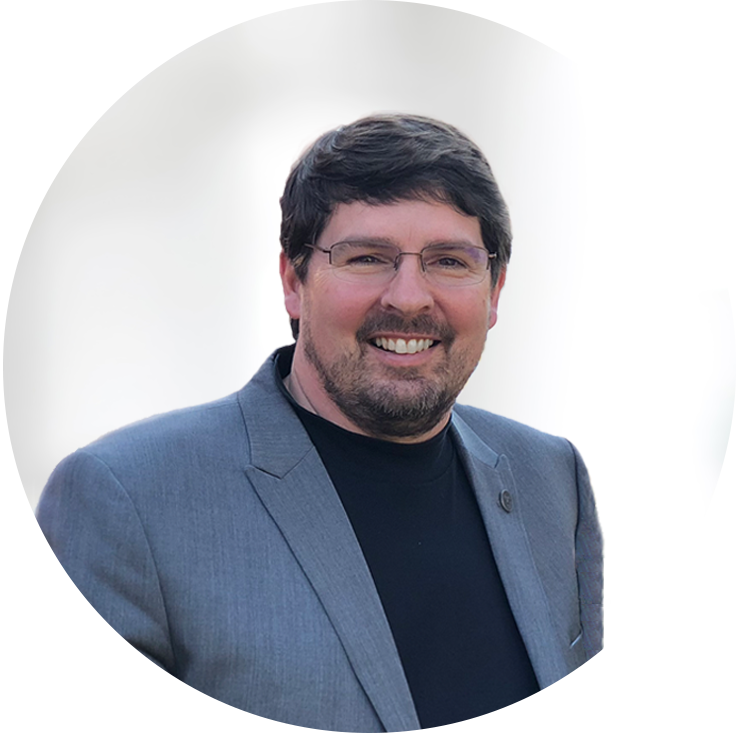 The Ventana Research Value Index: Contact Center in the Cloud in 2018 is the distillation of a year of market and product research efforts by Ventana Research. We utilized a structured research methodology that includes evaluation categories designed to reflect the breadth of the real-world criteria incorporated in a request for proposal (RFP) and vendor selection process for contact centers in the cloud. We evaluated AWS and 12 other vendors in seven categories, five relevant to the product (adaptability, capability, manageability, reliability and usability) and two related to the vendor (TCO/ROI and vendor validation). 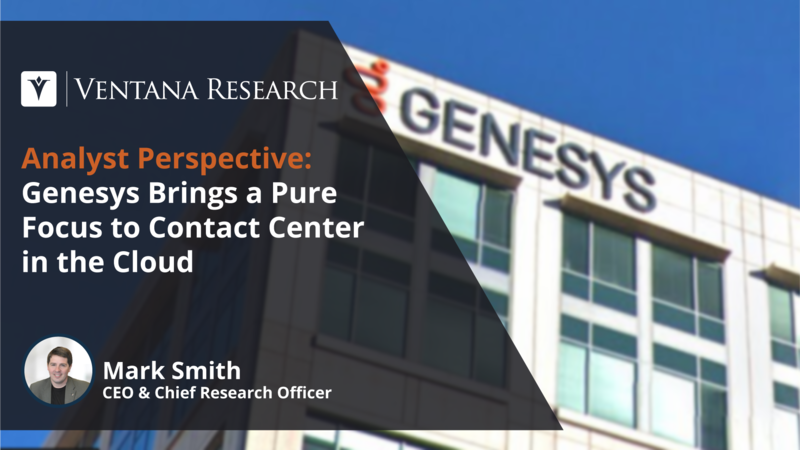 To arrive at the Value Index rating for a given vendor, we weighted each category to reflect its relative importance in an RFP process, with the weightings based on our experience and data derived from our benchmark research on contact centers in the cloud. I am happy to share some insight on 8x8 drawn from our latest research. 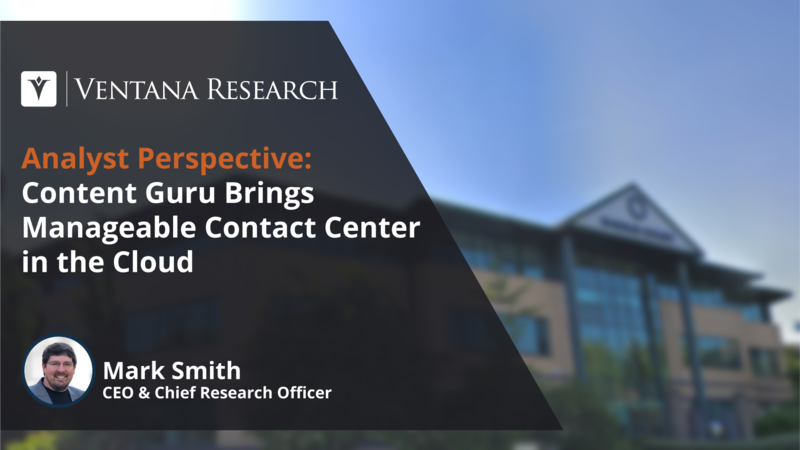 The Ventana Research Value Index: Contact Center in the Cloud in 2018 is the distillation of a year of market and product research efforts by Ventana Research. We utilized a structured research methodology that includes evaluation categories designed to reflect the breadth of the real-world criteria incorporated in a request for proposal (RFP) and vendor selection process for contact centers in the cloud. We evaluated 8x8 and 12 other vendors in seven categories, five relevant to the product (adaptability, capability, manageability, reliability and usability) and two related to the vendor (TCO/ROI and vendor validation). 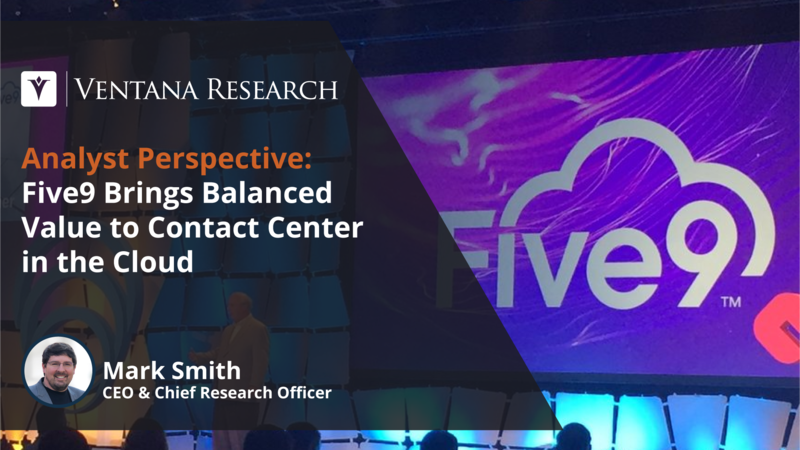 To arrive at the Value Index rating for a given vendor, we weighted each category to reflect its relative importance in an RFP process, with the weightings based on our experience and data derived from our benchmark research on contact centers in the cloud. . I am happy to share some insight on Five9 drawn from our latest research. 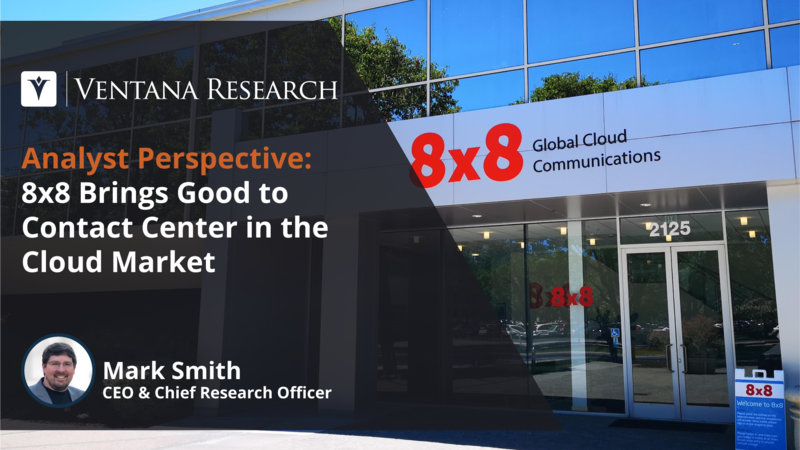 The Ventana Research Value Index: Contact Center in the Cloud in 2018 is the distillation of a year of market and product research efforts by Ventana Research. We utilized a structured research methodology that includes evaluation categories designed to reflect the breadth of the real-world criteria incorporated in a request for proposal (RFP) and vendor selection process for contact centers in the cloud. We evaluated Five9 and 12 other vendors in seven categories, five relevant to the product (adaptability, capability, manageability, reliability and usability) and two related to the vendor (TCO/ROI and vendor validation). To arrive at the Value Index rating for a given vendor, we weighted each category to reflect its relative importance in an RFP process, with the weightings based on our experience and data derived from our benchmark research on contact centers in the cloud. 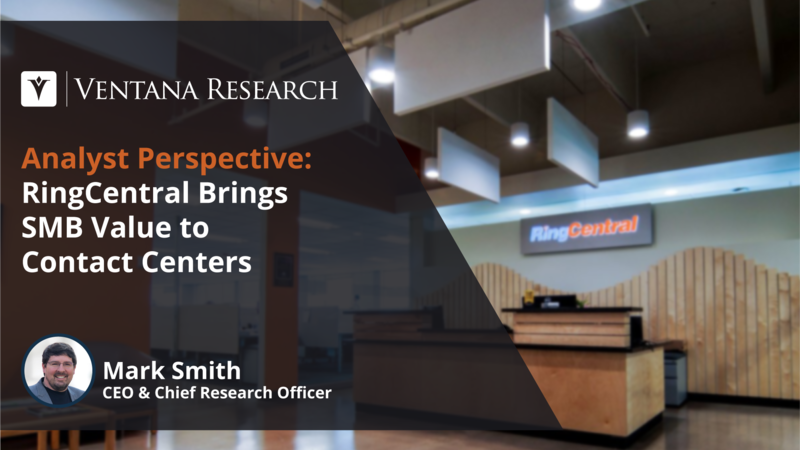 I am happy to share some insight on RingCentral drawn from our latest research. The Ventana Research Value Index: Contact Center in the Cloud in 2018 is the distillation of a year of market and product research efforts by Ventana Research. We utilized a structured research methodology that includes evaluation categories designed to reflect the breadth of the real-world criteria incorporated in a request for proposal (RFP) and vendor selection process for contact centers in the cloud. We evaluated RingCentral and 12 other vendors in seven categories, five relevant to the product (adaptability, capability, manageability, reliability and usability) and two related to the vendor (TCO/ROI and vendor validation). To arrive at the Value Index rating for a given vendor, we weighted each category to reflect its relative importance in an RFP process, with the weightings based on our experience and data derived from our benchmark research on contact centers in the cloud. I am happy to share some insight on IFS-mplsystems drawn from our latest research. 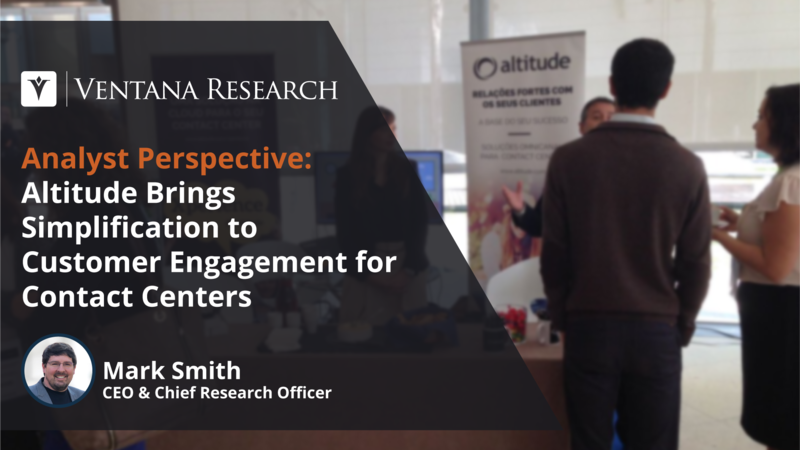 The Ventana Research Value Index: Contact Center in the Cloud in 2018 is the distillation of a year of market and product research efforts by Ventana Research. We utilized a structured research methodology that includes evaluation categories designed to reflect the breadth of the real-world criteria incorporated in a request for proposal (RFP) and vendor selection process for contact centers in the cloud. We evaluated IFS-mplsystems and 12 other vendors in seven categories, five relevant to the product (adaptability, capability, manageability, reliability and usability) and two related to the vendor (TCO/ROI and vendor validation). To arrive at the Value Index rating for a given vendor, we weighted each category to reflect its relative importance in an RFP process, with the weightings based on our experience and data derived from our benchmark research on contact centers in the cloud. I am happy to share some insight on Serenova drawn from our latest research. 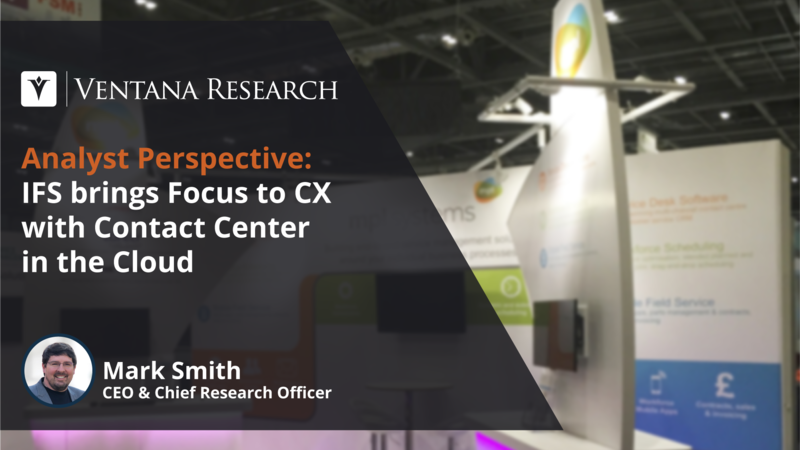 The Ventana Research Value Index: Contact Center in the Cloud in 2018 is the distillation of a year of market and product research efforts by Ventana Research. We utilized a structured research methodology that includes evaluation categories designed to reflect the breadth of the real-world criteria incorporated in a request for proposal (RFP) and vendor selection process for contact centers in the cloud. We evaluated Serenova and 12 other vendors in seven categories, five relevant to the product (adaptability, capability, manageability, reliability and usability) and two related to the vendor (TCO/ROI and vendor validation). To arrive at the Value Index rating for a given vendor, we weighted each category to reflect its relative importance in an RFP process, with the weightings based on our experience and data derived from our benchmark research on contact centers in the cloud. 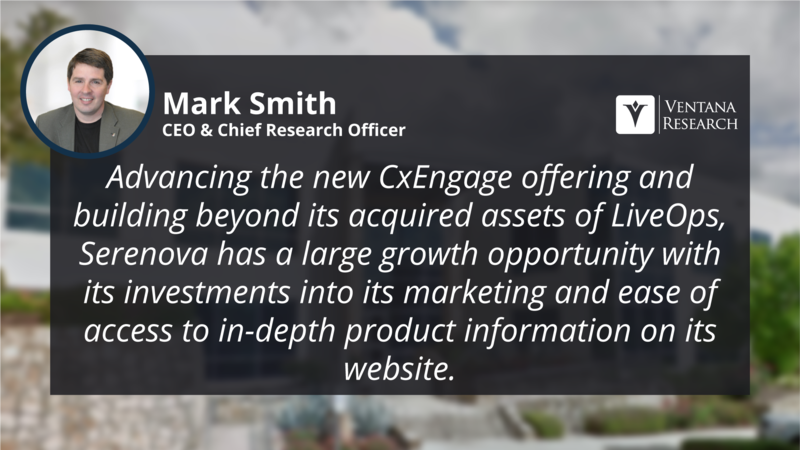 I am happy to share some insight on Genesys drawn from our latest research. 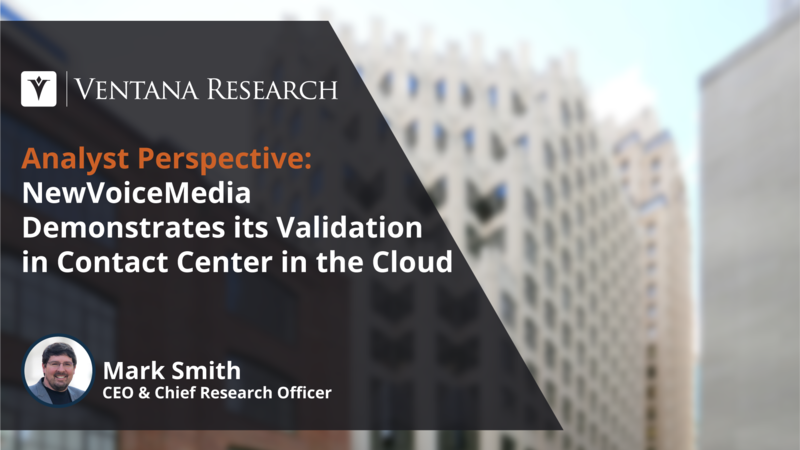 The Ventana Research Value Index: Contact Center in the Cloud in 2018 is the distillation of a year of market and product research efforts by Ventana Research. We utilized a structured research methodology that includes evaluation categories designed to reflect the breadth of the real-world criteria incorporated in a request for proposal (RFP) and vendor selection process for contact centers in the cloud. We evaluated Genesys and 12 other vendors in seven categories, five relevant to the product (adaptability, capability, manageability, reliability and usability) and two related to the vendor (TCO/ROI and vendor validation). To arrive at the Value Index rating for a given vendor, we weighted each category to reflect its relative importance in an RFP process, with the weightings based on our experience and data derived from our benchmark research on contact centers in the cloud.